There’s a lot said about value stream mapping. But where does it really fall short? Well, it’s process-focused. Process is one thing; people are a whole different animal. While there’s certainly a lot of good that can come from value stream mapping, it has some limitations, too. When we push the boundaries of those limitations, we can see the realm Rob England and Mark Whiting are getting into when they discuss the pros and cons of the manufacturing paradigm. There are quite a few lenses we can look through when it comes to the flow of value mapping. It flows left to right in the classical lens, but we can look at it another way, too. It’s all about systems and networks. First of all, our systems are complex. And these systems have boundaries. At these boundaries, the systems become arbitrarily complex. Typically, we’ll think about systems from a narrow perspective. See, all of our systems are interconnected in some way to a broader network. Can we map the value stream of this complex network? For one thing, the network is always changing. Take a river, for example. Rivers change over time. The borders for a state in the U.S. along the Mississippi river once followed the center of the river. Over time, the river shifted but the borders remain. You can see this on a map. This brings us to complex systems thinking. Systems thinking is relatively new and hasn’t really evolved at the same pace that our actual systems have. The manufacturing paradigms such as lean and Kanban are tailored for relatively static, linear systems. But we really deal with networks, which are much more complex and ever-changing. 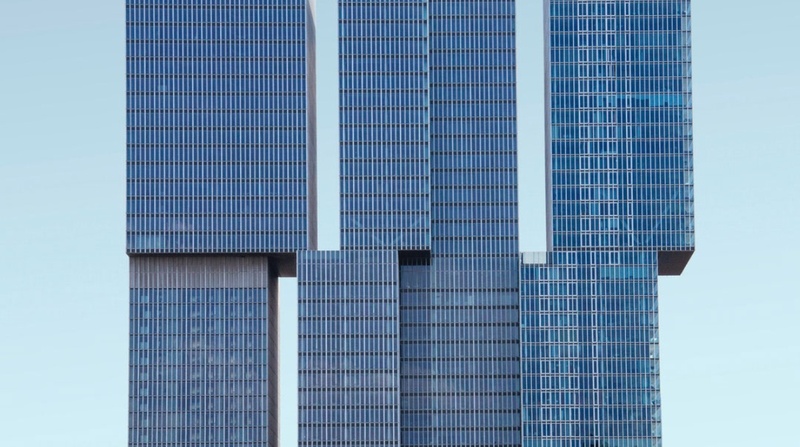 How Do We Deal With Complexity? In the Harvard Business Review, Dave Snowden and Mary Boone said that “Wise executives tailor their approach to fit the complexity of the circumstances they face.” What they mean, simply, is that flexibility is important. 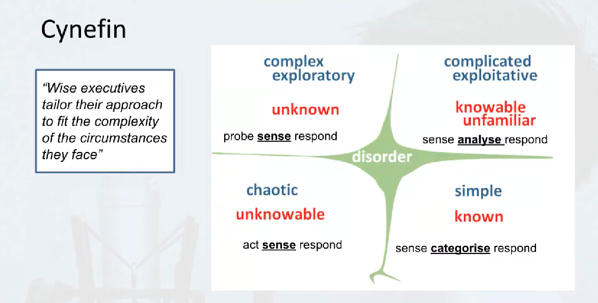 This Cynefin framework is a model for looking at various complexities. Complex systems, such as pedestrians in a city, cannot be fully described. However, in the realm of complexity, we can win by being dynamic. Thinking in terms of “value networks” over “value streams” can give us the advantage. 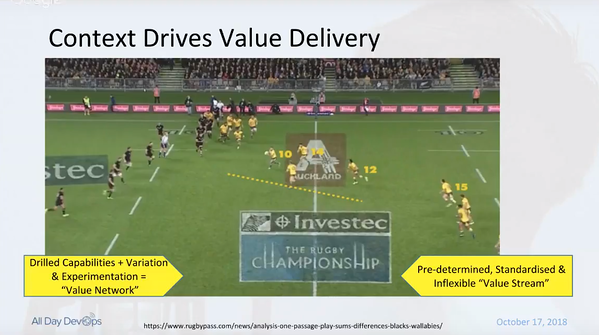 Successful teams in sports organizations play dynamically rather than using fixed plays. They train and understand the pieces of the value network enough to be able to react to the moment and put together the right moves. This is a highly social dynamic. Can computers (AI) or predetermined processes match these pro-social behaviors? In terms of development teams, the value network and the cells in the network need to be able to self-heal. The best managers leave room for decisions to happen close to the work. This is one area where value streams fall short. See, value streams only take a linear perspective. Therefore, the value stream can only tell part of the story. It’s important to have this view, but that view shouldn’t end there. The IT value chain is one clear example of a value stream. 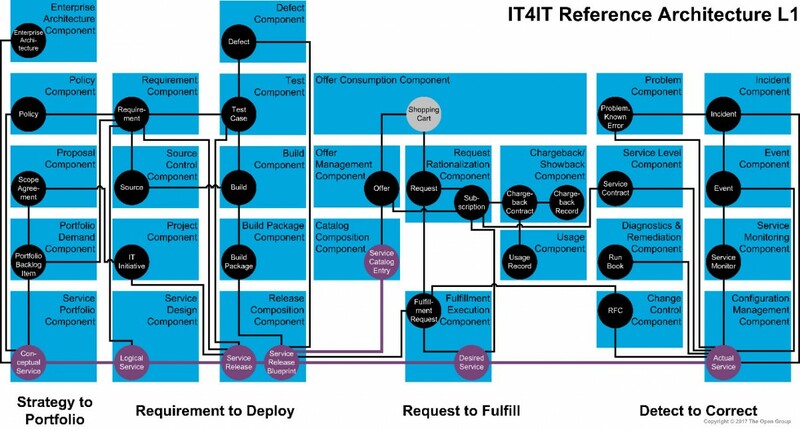 If you want to visualize how this might look, the IT4IT Reference Architecture is a model of four value streams with 16 processes, and it’s a useful tool for looking at IT as a value stream. You’ll benefit from using this, especially as a reference architecture, because it can be automated using standardized tools. Now, when we zoom out a bit, we get into value chains. Value chains add another dimension. It’s a group of interlaced streams within an organization. And when you zoom out further, you start to loop in externalities like supplier value chains, vendor value chains, and customer value chains. At this level, we start to get into the network streams. 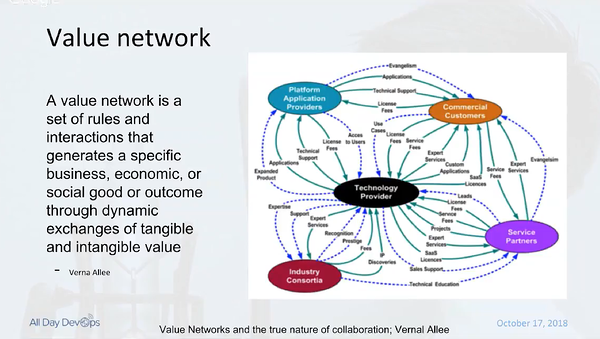 In this diagram, we can see how complex value networks can really get. From these many lines connecting a few nodes, it’s clear how important it is to have decision-making close to the work. There are so many relationships to consider. Also, information is spread throughout in a way that can cause “knowledge bottlenecks.” It’s easy to see how a single process just can’t be applied to the entire network. People power is needed throughout to win in this sort of complex system. It comes down to the dynamic nature of our systems. When we think we understand the system, it changes right under our noses. We need to be able to abstract. Abstraction is an important way for us to sort of ignore the details and keep the important parts in our heads. In other words, we can only understand dynamic systems at a higher level. The details that change regularly shouldn’t be so much in focus. Keep mapping your value chains, streams, and networks. Build capabilities by iterating over “plays” and planning for scenarios. Complex systems will fail. We have to design for failure and always-broken systems. Planning for failure means drilling, planning, and building capabilities. Want success in knowledge work where systems are arbitrarily complex and dynamic? That success depends upon people with capabilities making dynamic decisions. Missed Rob England and Mark Whiting’s session, or want to see some other great presentations from October 17? Head over to https://www.alldaydevops.com/live and make sure you’re registered. Then, catch up on what you missed (or re-watch your favorites)! Phil Vuollet uses software to automate process to improve efficiency and repeatability. He writes about topics relevant to technology and business, occasionally gives talks on the same topics. You can find him blogging at thedailylessonlearned.com.